On Sept. 13, 2015, the moon will partially obscure the sun from view in southern Africa and much of Antarctica during a partial solar eclipse. An eclipse occurs when the moon passes directly—or nearly directly, in the case of a partial solar eclipse—between the sun and Earth. Because the moon’s orbit is slightly tilted with respect to the sun-Earth line, its shadow only infrequently passes across Earth’s surface. The Sept. 13 partial eclipse will be an example of a less dramatic eclipse – the moon will only cover about 80 percent of the sun, which will not equate to noticeable reduction in light for observers on the ground. If you're lucky enough to be in one of the areas in the Southern Hemisphere that will see the eclipse, remember that you should never look at the sun directly. A partial eclipse should only be observed by using a telescope with a special solar filter, eclipse glasses, or a pinhole projector. Such partial eclipses are of limited scientific value, unlike total solar eclipses, which can grant unique views of the sun's atmosphere. Scientists are gearing up for a total solar eclipse on Aug. 21, 2017. The August 2017 total eclipse will be visible from an approximately 100-mile-wide path that cuts diagonally across the United States. Those in North America who are not along this narrow path—called the path of totality—will see a partial solar eclipse that day. The August 2017 eclipse will be the first total solar eclipse visible from the contiguous United States since Feb. 26, 1979. During a total solar eclipse, the moon completely blocks the sun’s incredibly bright face. 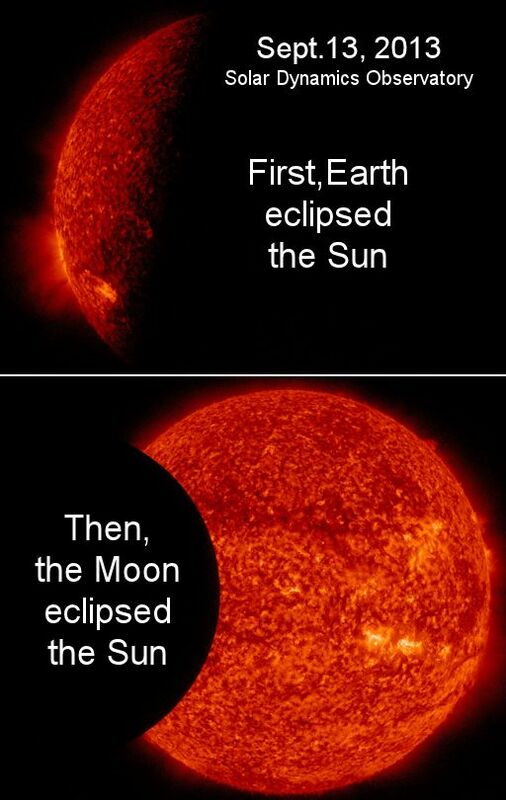 This is possible because, though the sun’s diameter is about 400 times the moon’s diameter, the sun is also about 400 times farther away from us than the moon is, making them appear to be approximately the same size from Earth. With the face obscured, the sun’s atmosphere—the corona, which is about a million times dimmer than the face—becomes visible to eclipse-watchers. It was only because of total solar eclipses that early scientists could observe the sun’s wispy atmosphere, providing some of the earliest insight into our dynamic sun. Most modern solar observations of the corona are taken with an instrument called a coronagraph, which uses a disk to block the sun in a camera’s field of view, but coronagraphs obscure part of the inner corona as well—which doesn't happen during a total eclipse. In this image from a coronagraph onboard the joint ESA and NASA Solar and Heliospheric Observatory, or SOHO, the white circle in the center of the occulting disk represents the outer reaches of the sun’s surface. The apparent diameter of the occulting disk is twice the sun’s. In comparison, the apparent diameter of the moon will be only about three percent larger than the sun’s during the total solar eclipse of Aug. 21, 2017. This will allow observers on the ground fantastic views of the sun’s inner corona. Meanwhile on Earth, an ordinary partial eclipse was visible. People in South Africa and parts of Antarctica saw the Moon pass in front of the sun, off-center, producing crescent-shaped shadows and strange sunrises. Check the realtime photo galleryfor their images http://spaceweathergallery.com/. Er zijn nu 587 mensen aan het browsen op het forum. 4 Daarvan zijn ingelogd. Van die 587, lezen 10 mensen het topic "Winter 2011 discussietopic deel 5".